We are very proud to announce we achieved our 'Active Flag' in June 2017! 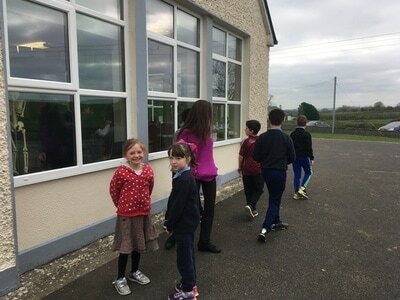 It is now proudly flying outside our school! We are working toward our 'Active School' Flag this year so watch this space! 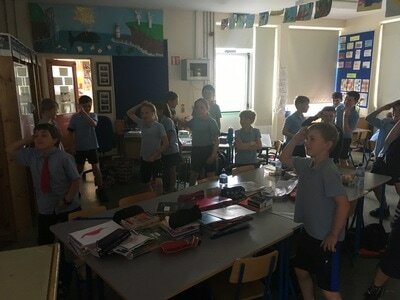 ​Look at the slideslow below to find out more about the Active flag! 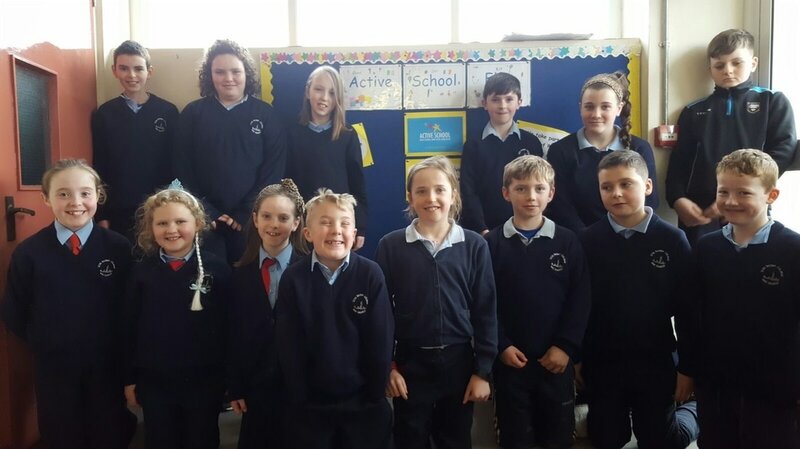 Our Active School Committee 2016/2017 - They are from 1st class to 6th class. Back Row: Garry, Rebecca, Aimee, Matthew, Rachel, Diarmuid. 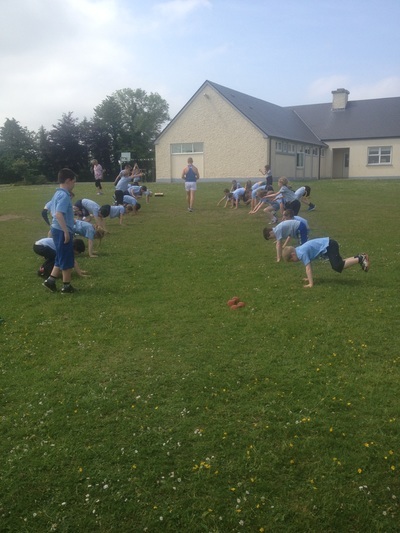 Such a fun filled week from bootcamps to golf and boxing to yoga, we were very active all week long. 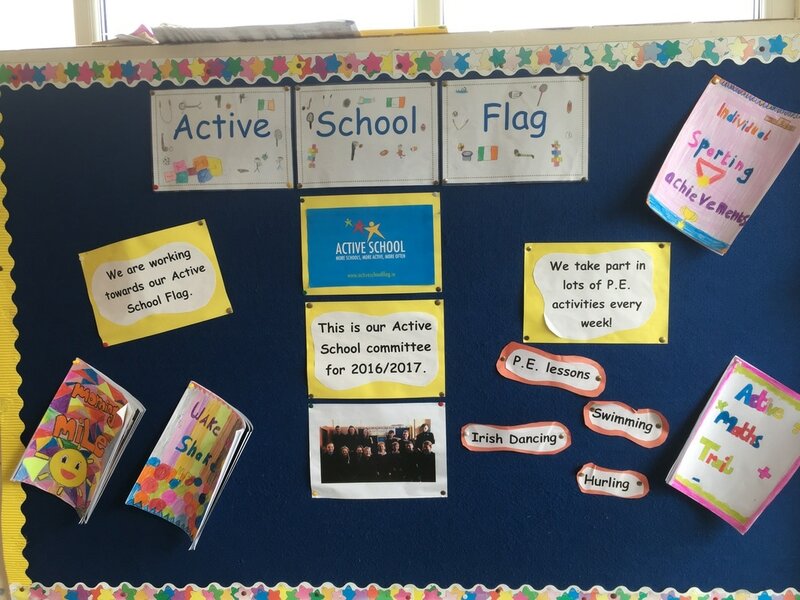 Our 'Active Flag' display where we celebrate school and individual sporting achievements. 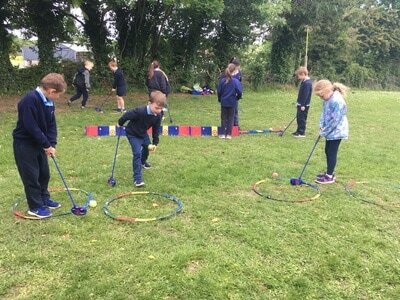 One of our active trails this year....our Maths trail. 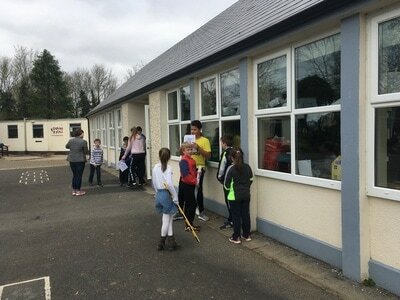 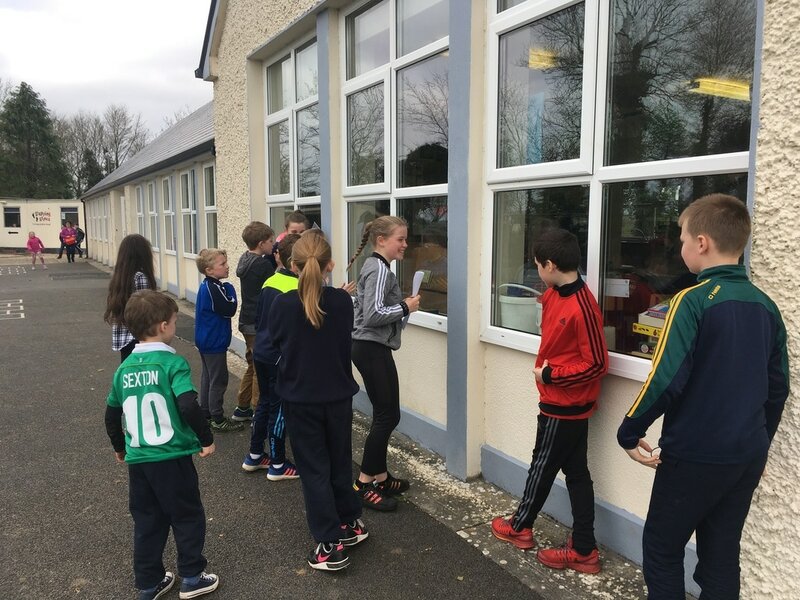 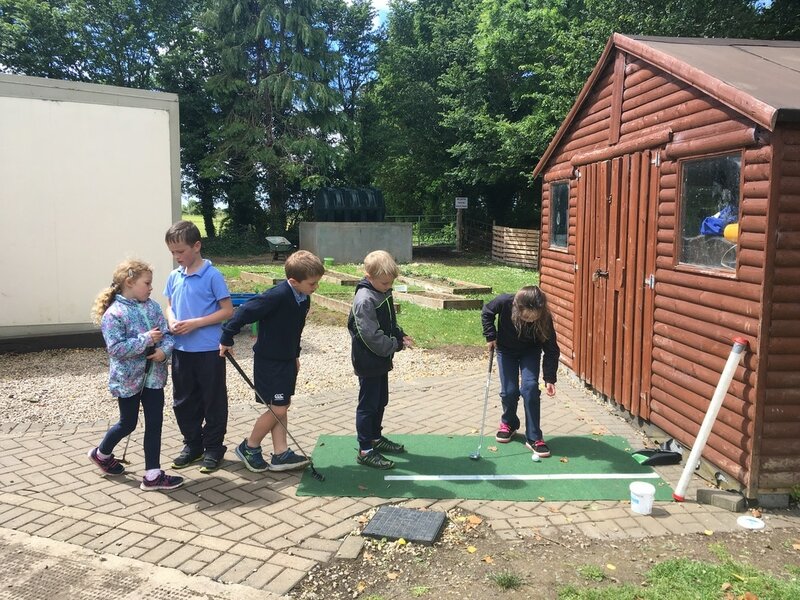 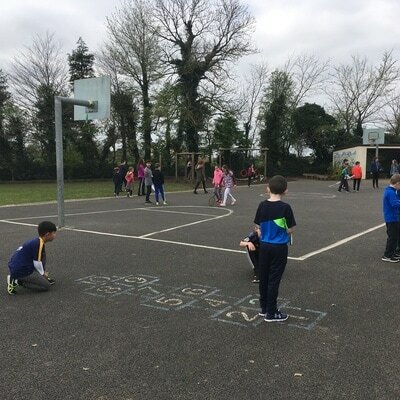 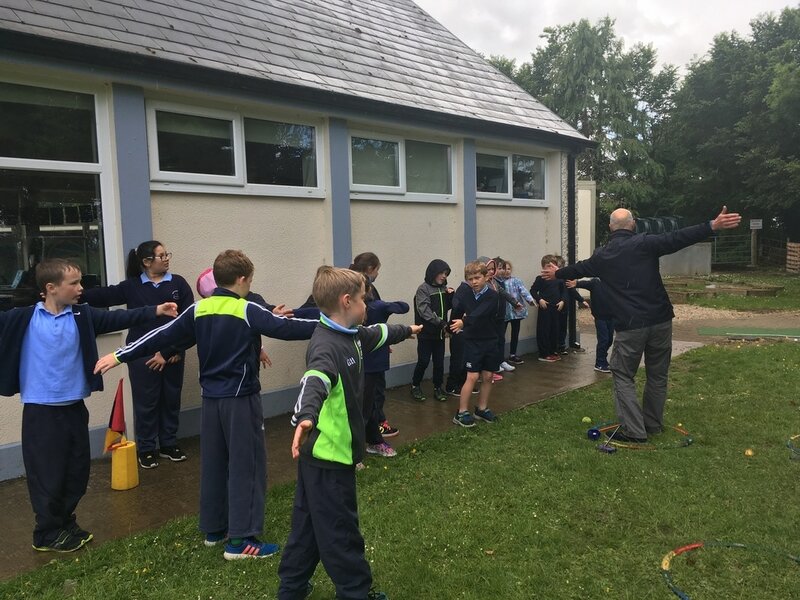 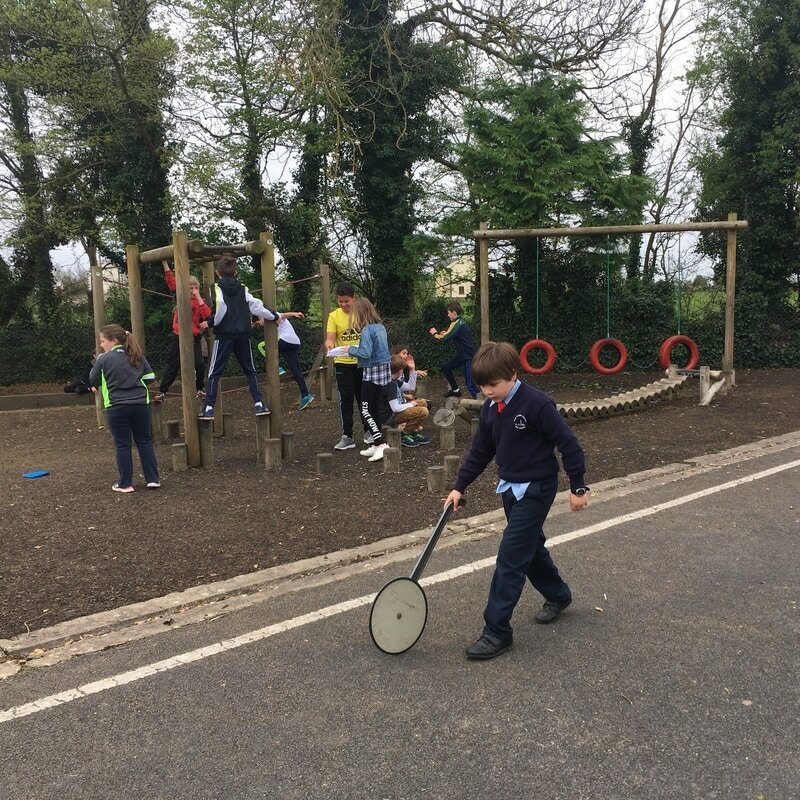 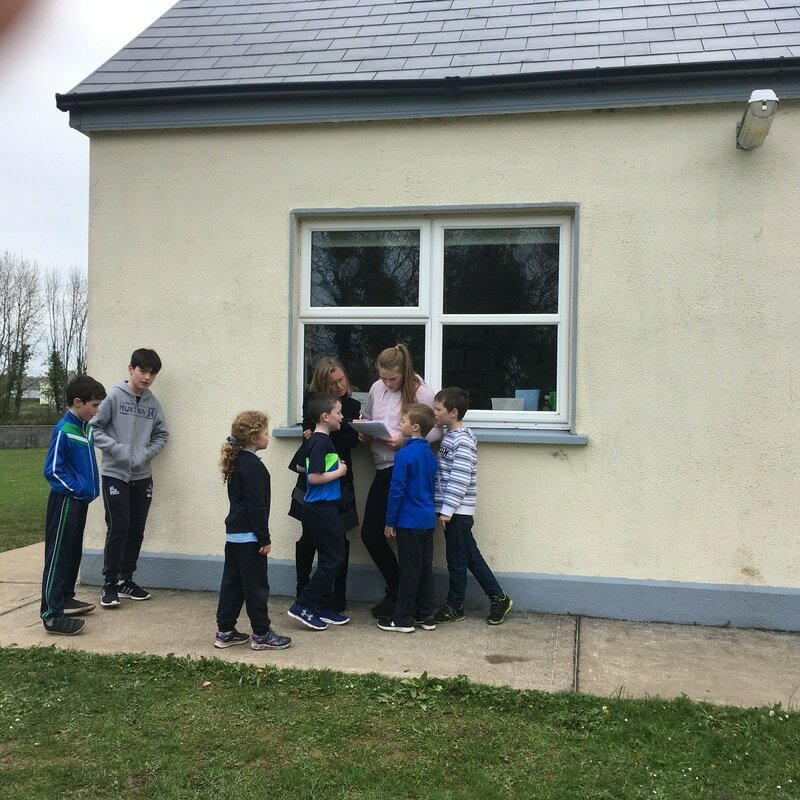 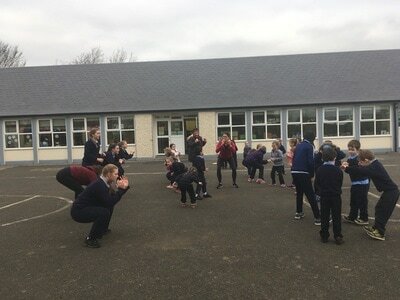 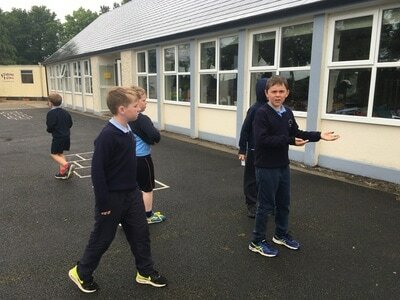 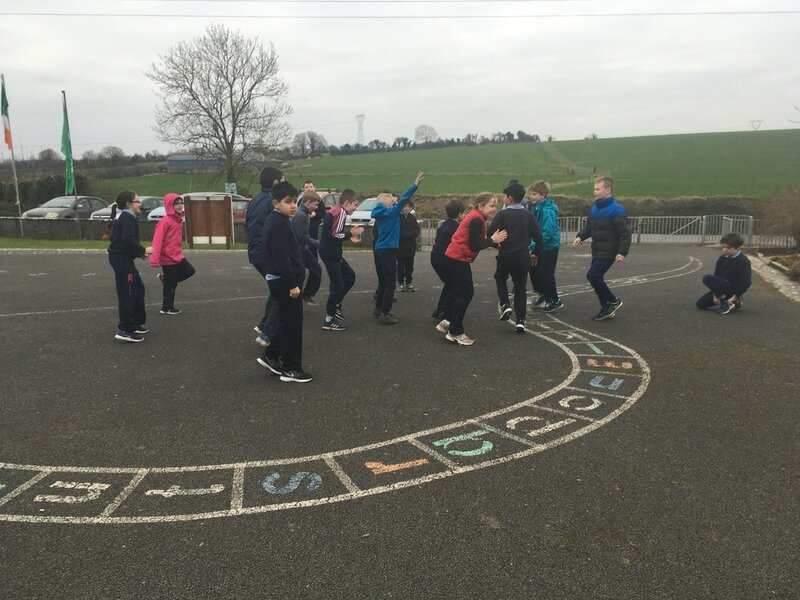 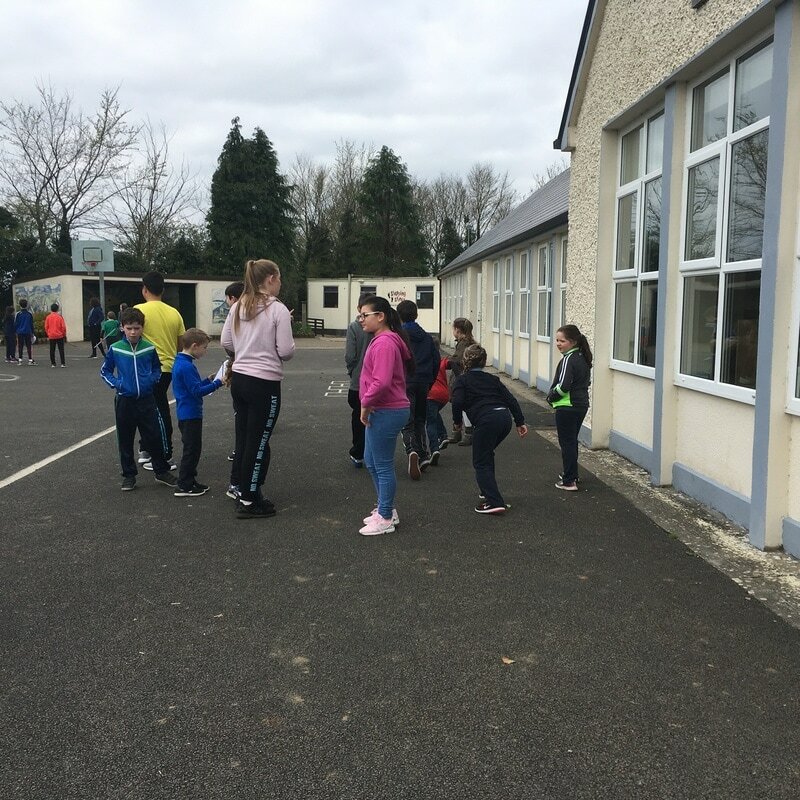 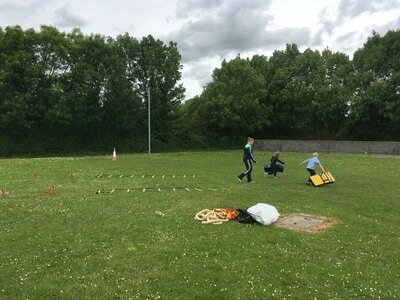 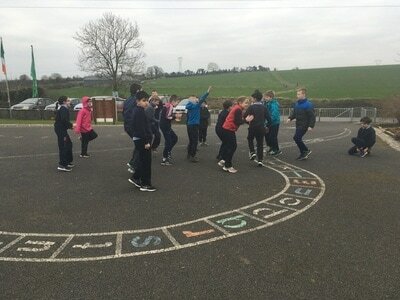 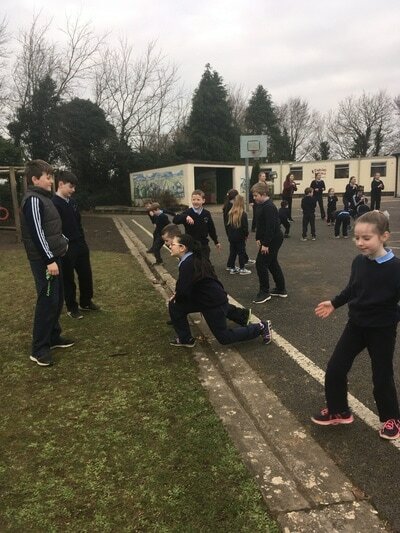 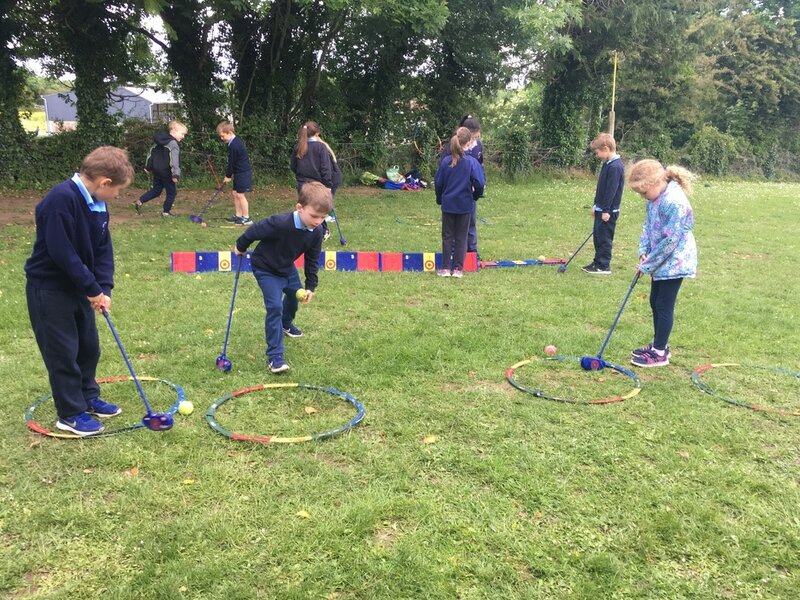 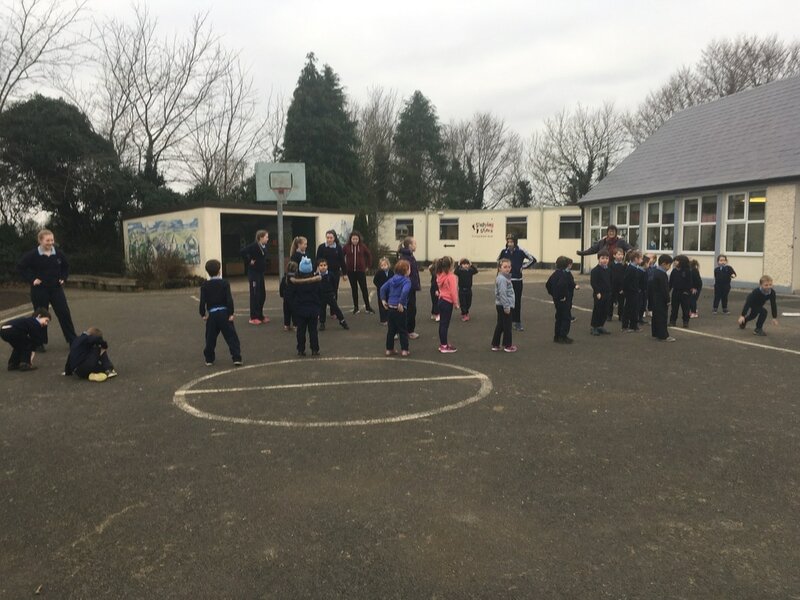 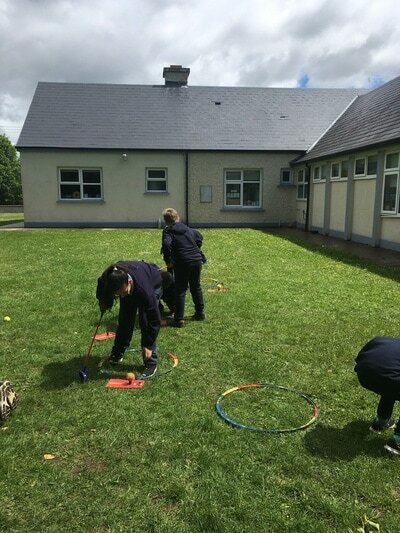 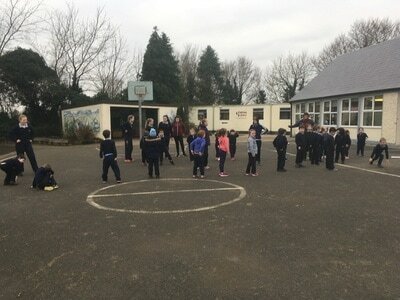 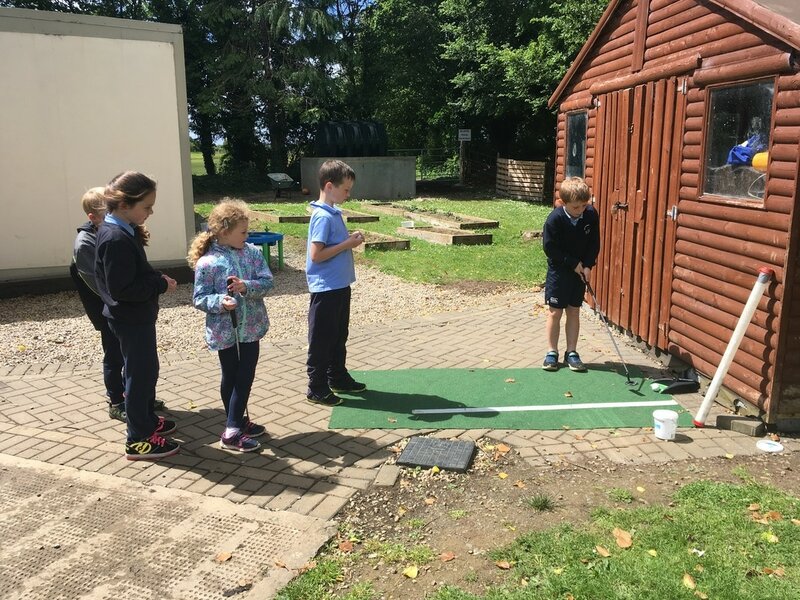 1st - 6th class completed the Maths trail in groups while Junior and Senior Infants completed their own Maths sessions on the pitch. 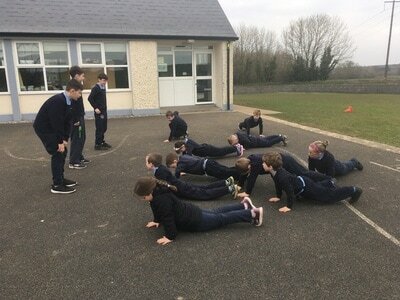 Feb '17 -We took part at 10@10 on the 10th of February as part of the Operation Transformation programme. 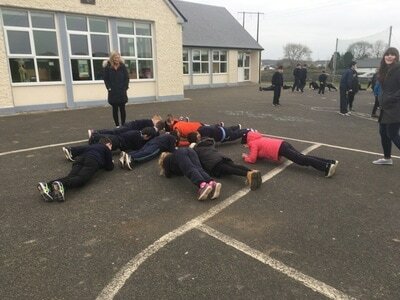 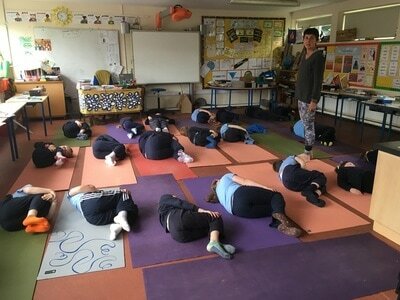 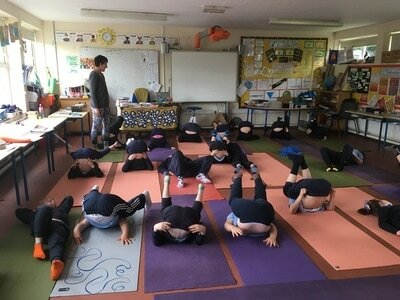 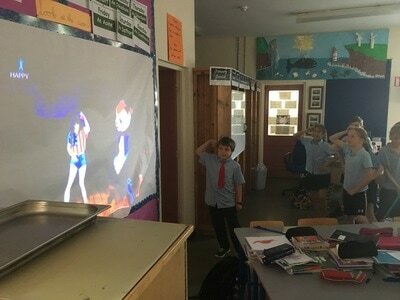 All children and teachers were involved..what a great way to wake up in the morning. 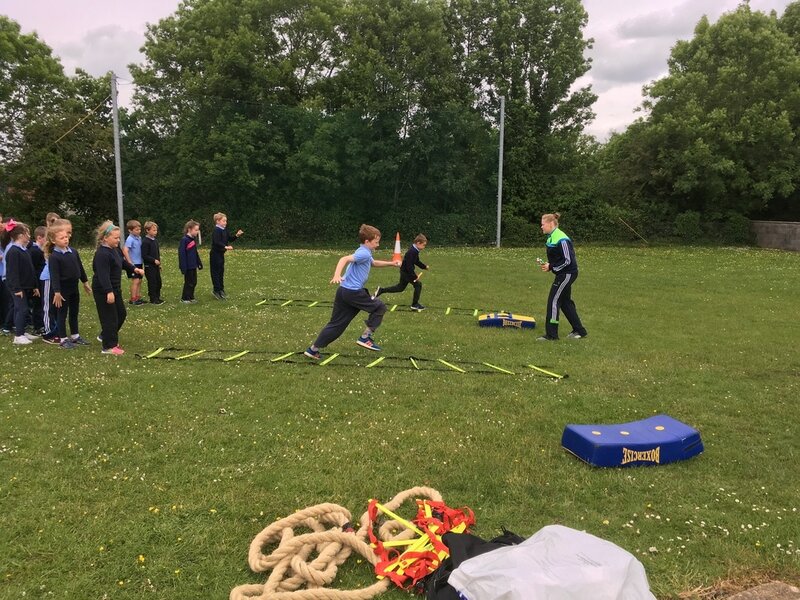 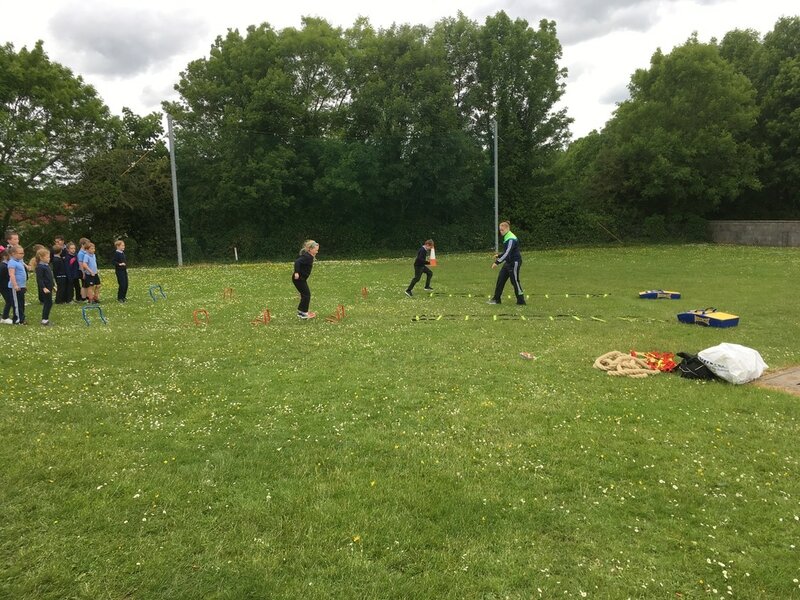 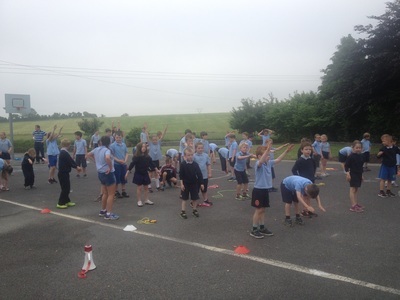 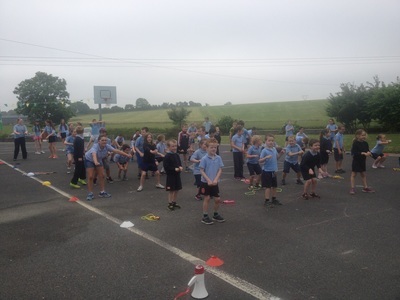 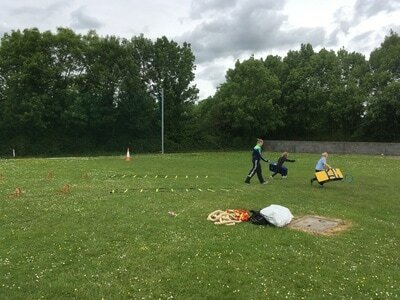 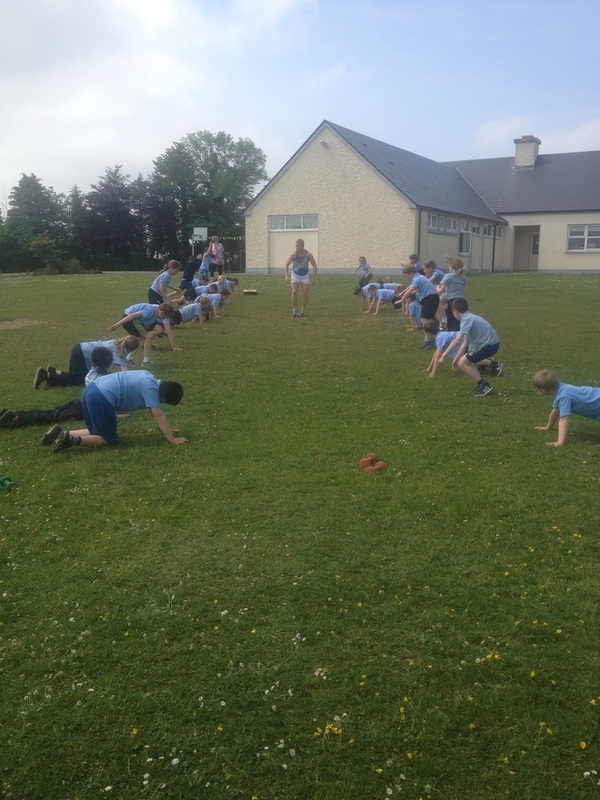 ​Active school week June 2016 - Martin Nestor from the local Lady Gregory gym came out to put us through our paces with a tough bootcamp! Thank you Martin! 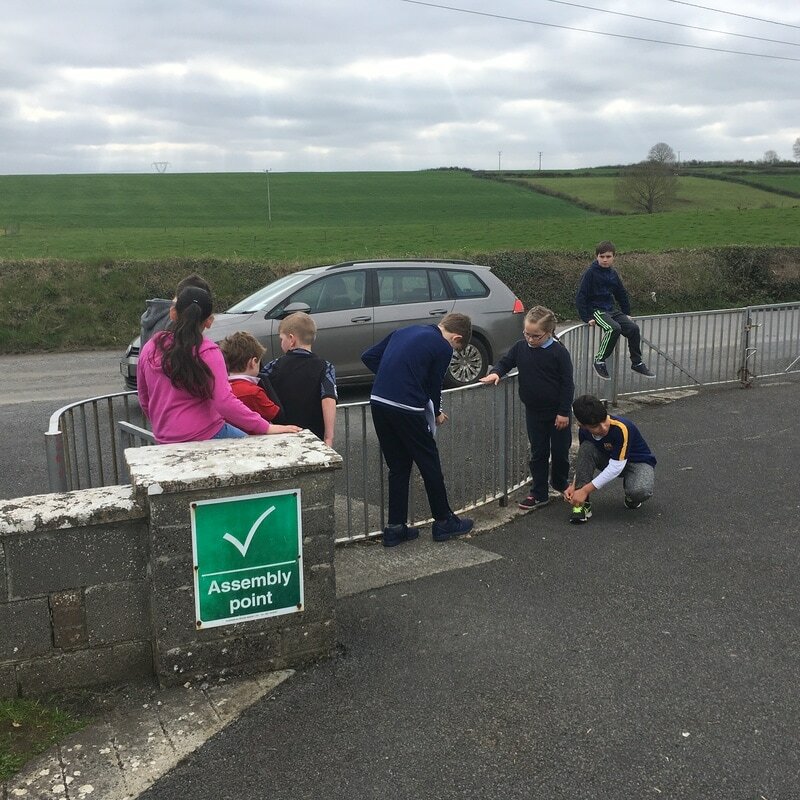 We are working towards attaining an Active School Flag again this year. 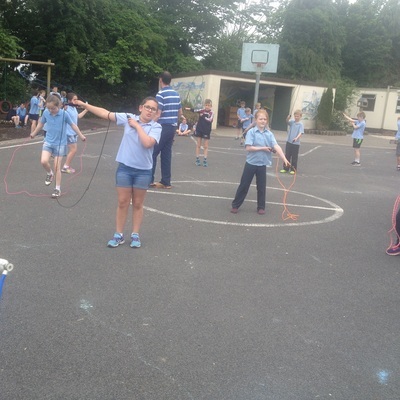 We have elected our committee and have planned and held a fantastic Active School week. 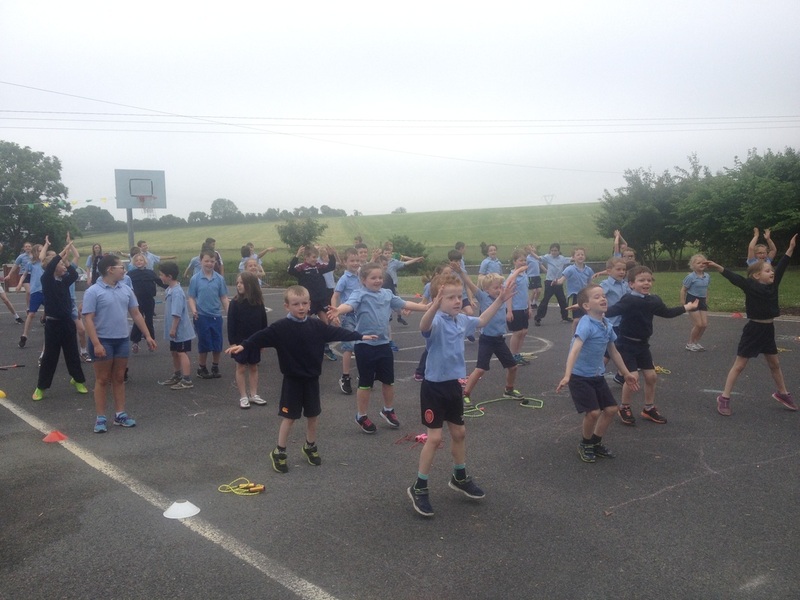 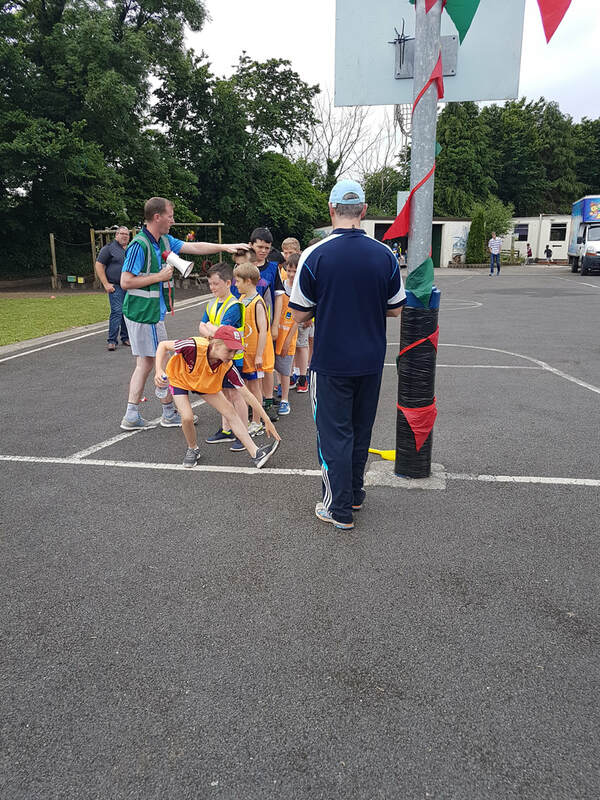 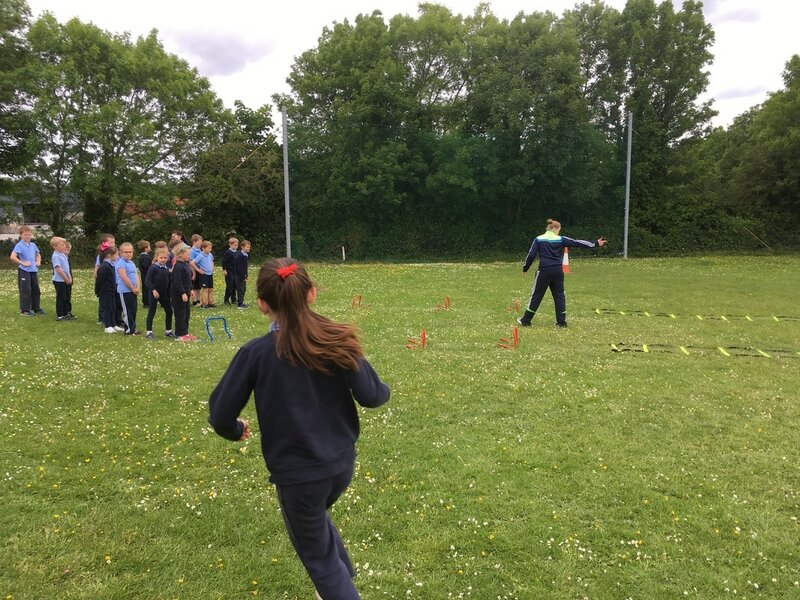 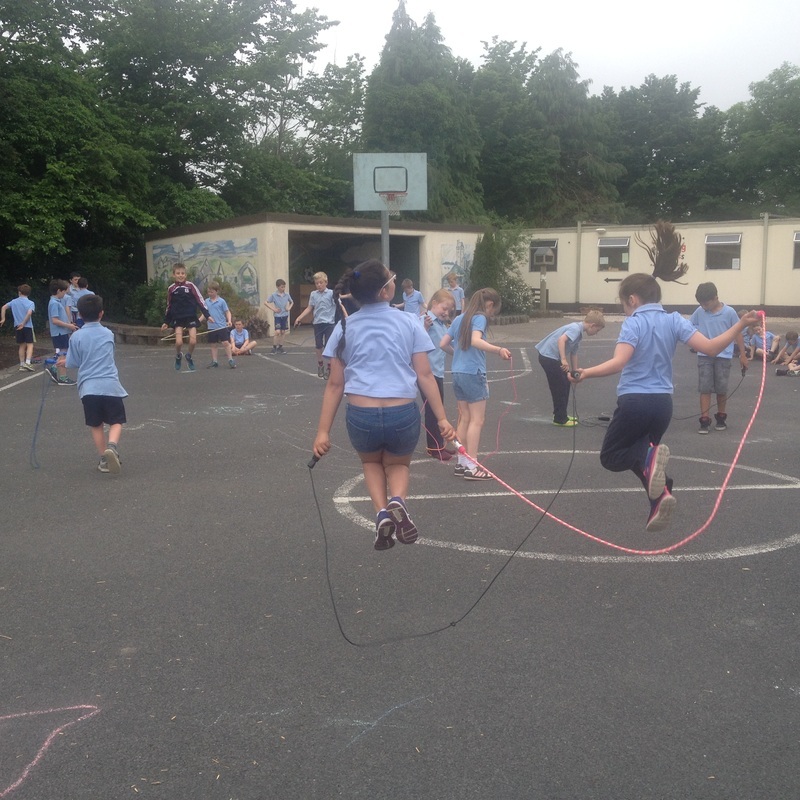 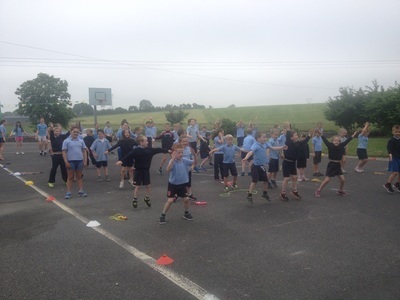 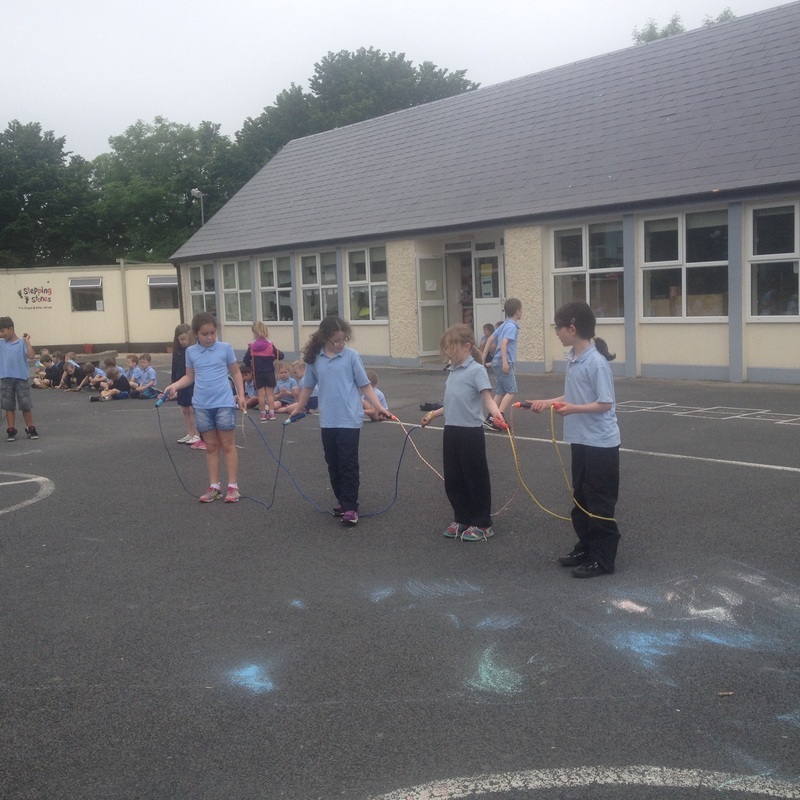 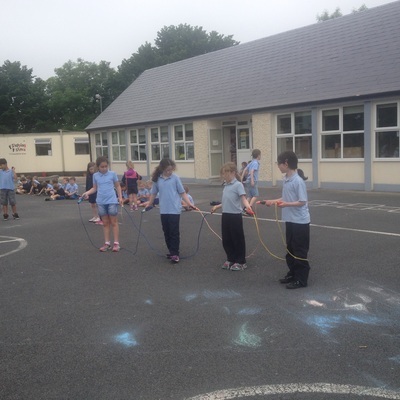 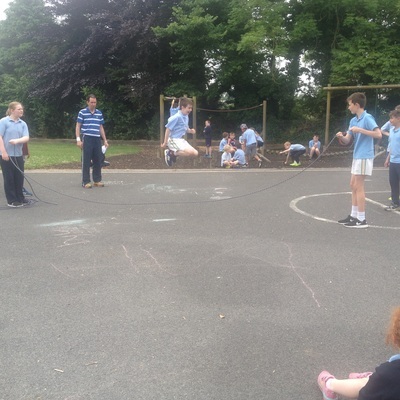 Our Active School Week was held from 7th to the 10th of June. During the week, we had a great variety of different activities. 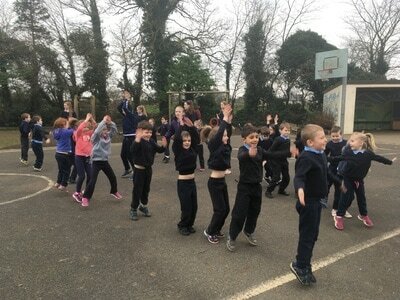 We started each day with a 'wake-up' routine with the whole school. 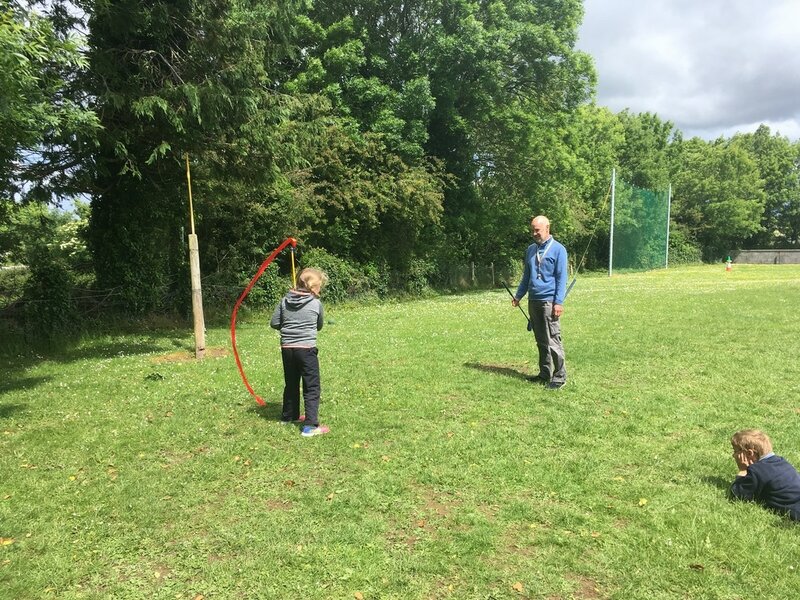 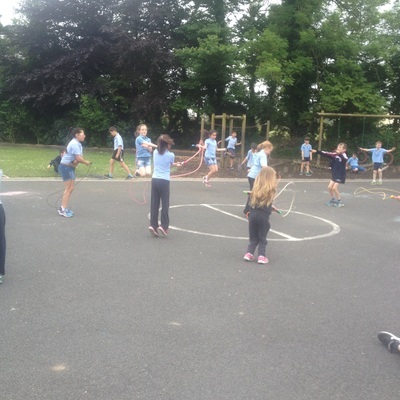 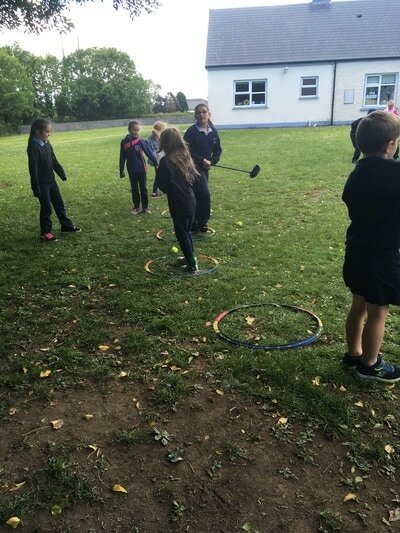 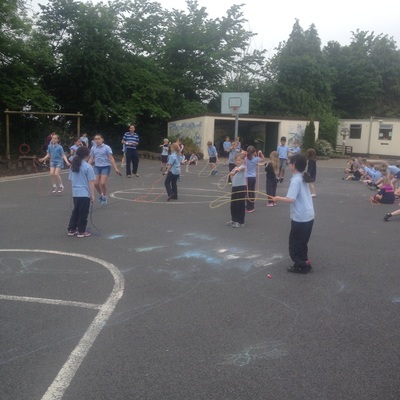 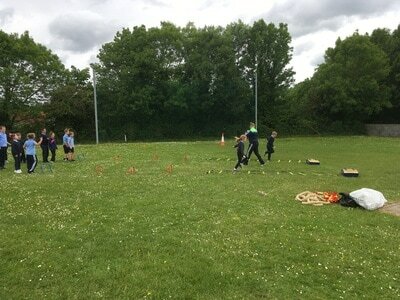 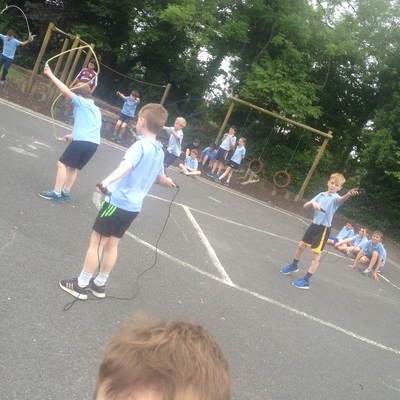 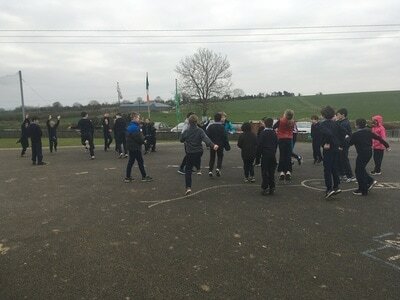 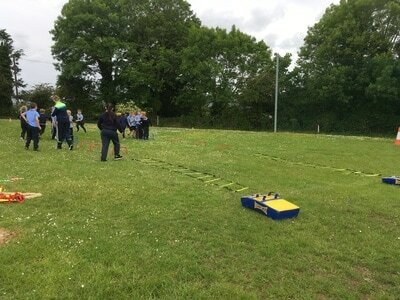 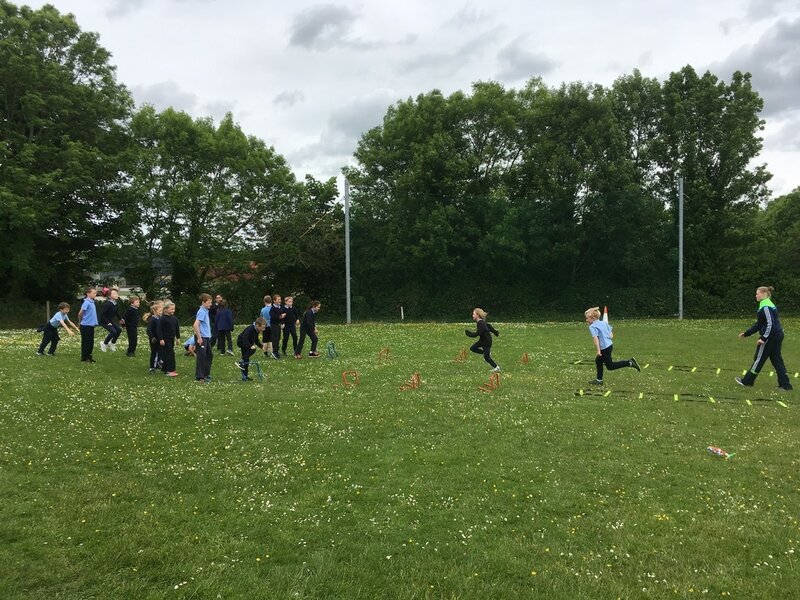 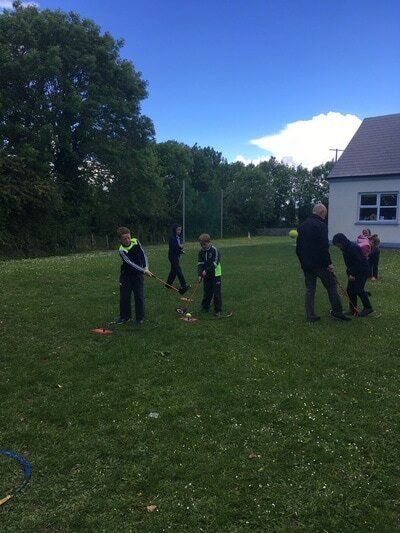 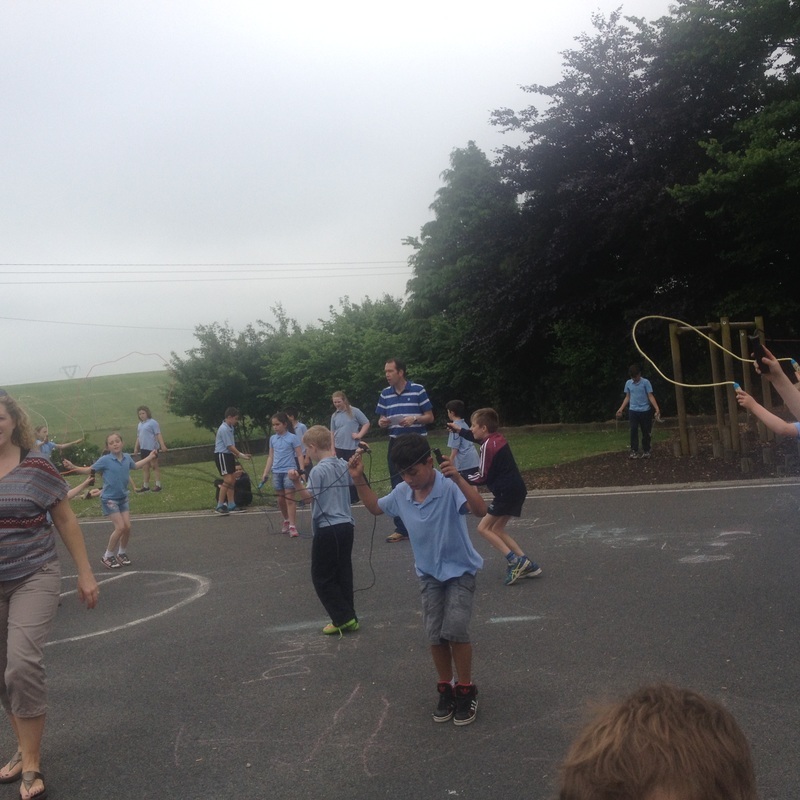 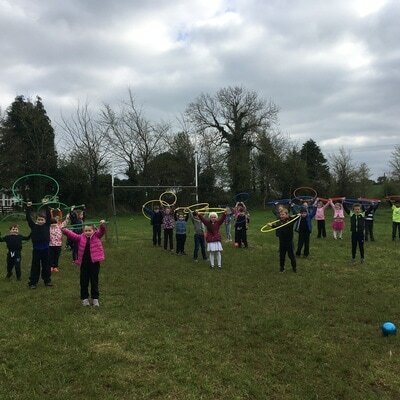 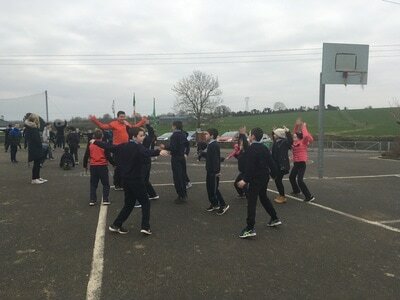 On Tuesday, we started the day with hurling and had Olympic activities in the afternoon. 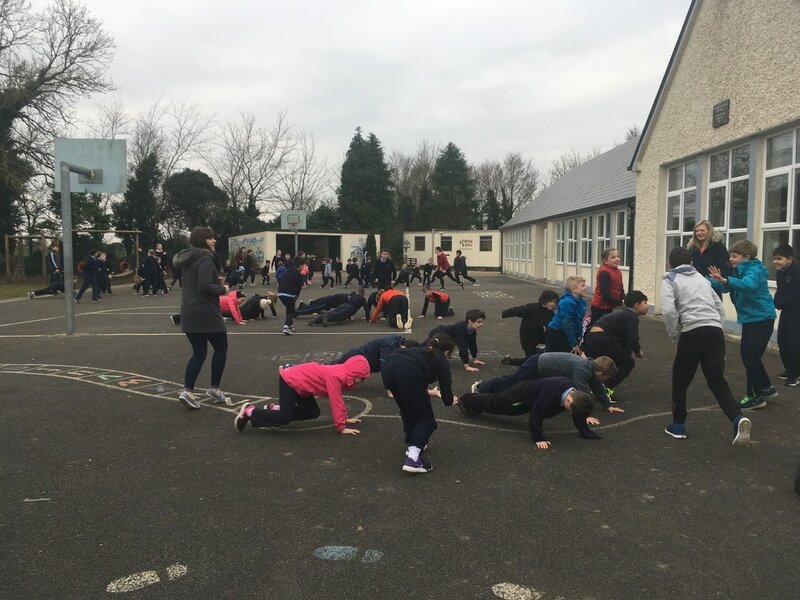 On Wednesday, we had skipping demonstrations, Martin Nestor put the children through their paces in bootcamp and they also thoroughly enjoyed their boxing session with Rory, Martin and Hugh. 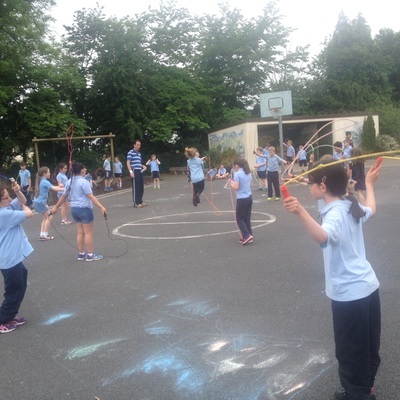 On Thursday, 1st-6th went to the hurling final to support our team and we won the final! 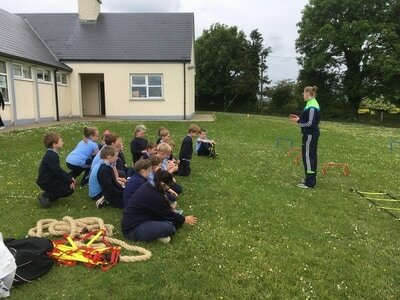 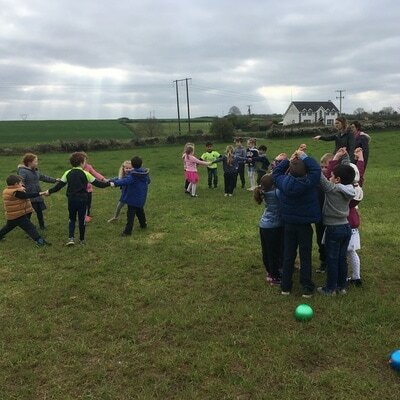 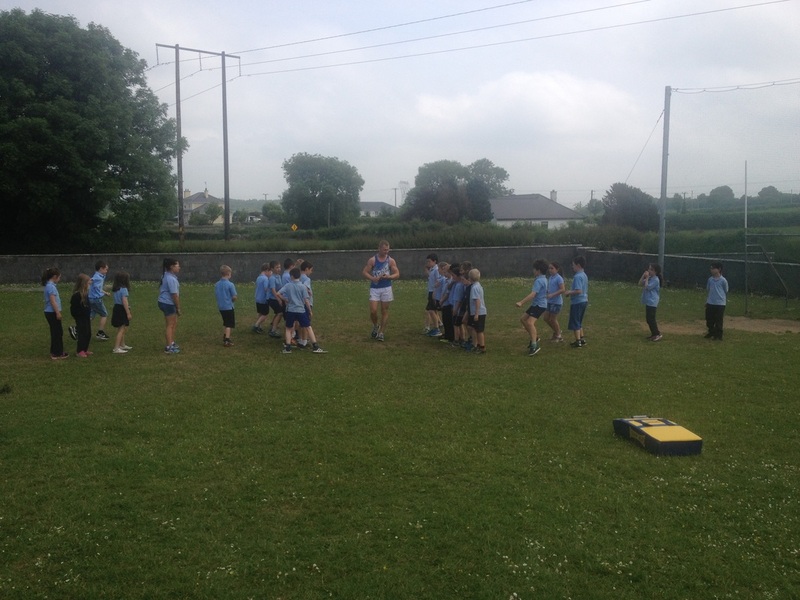 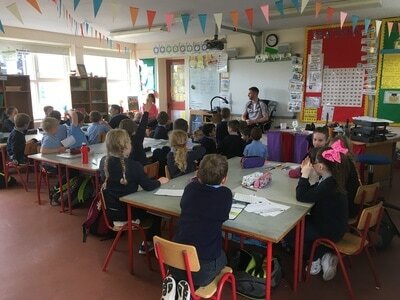 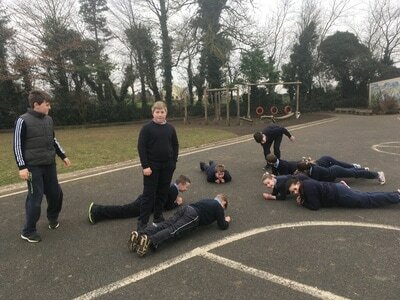 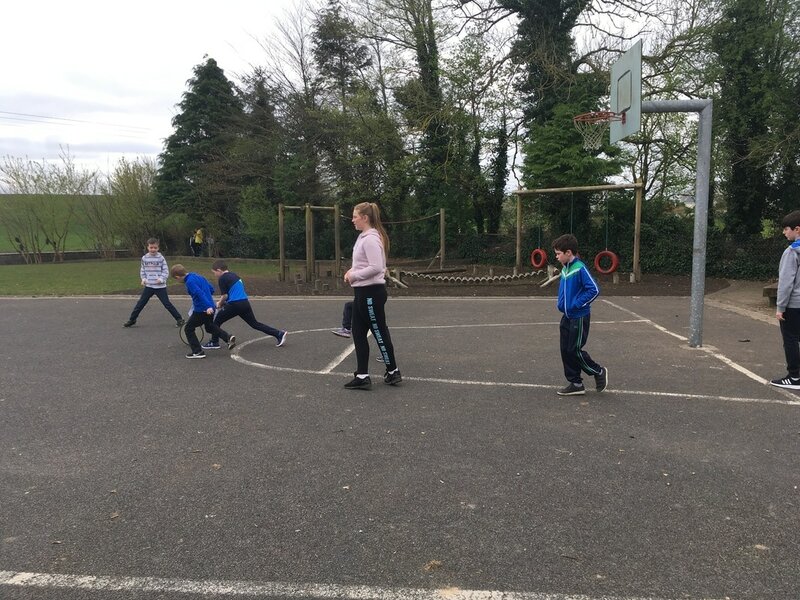 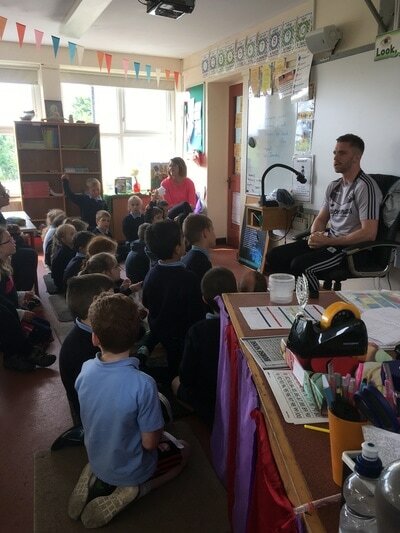 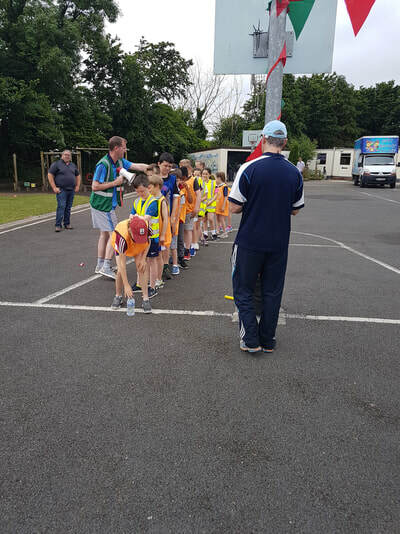 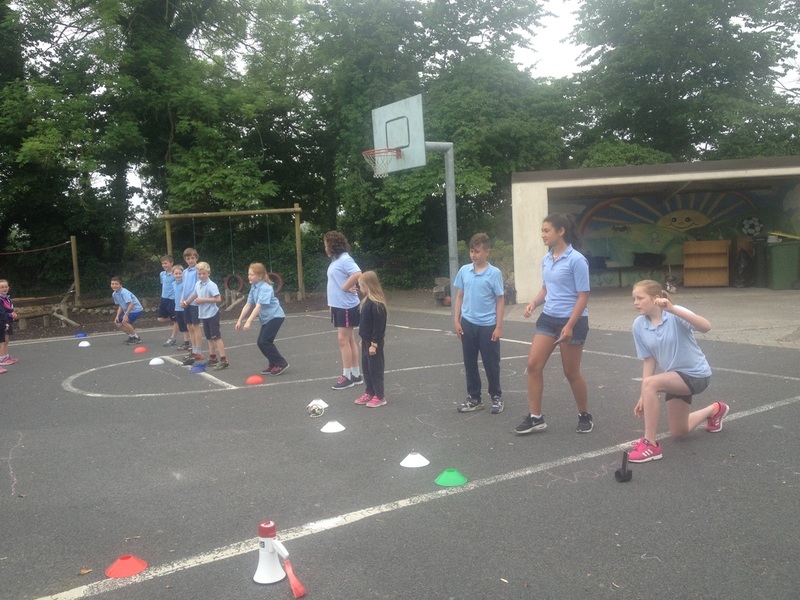 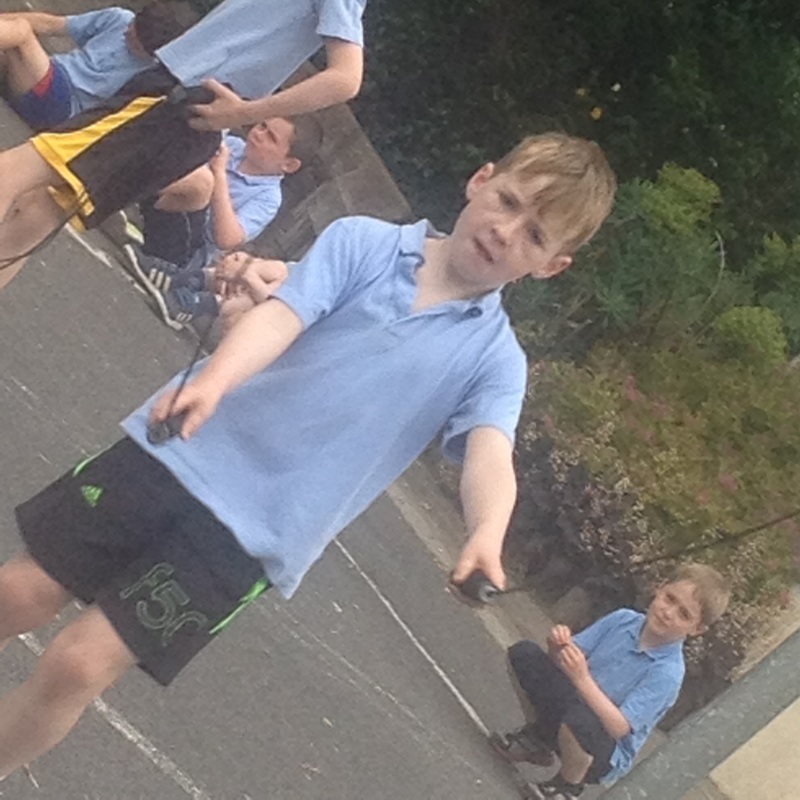 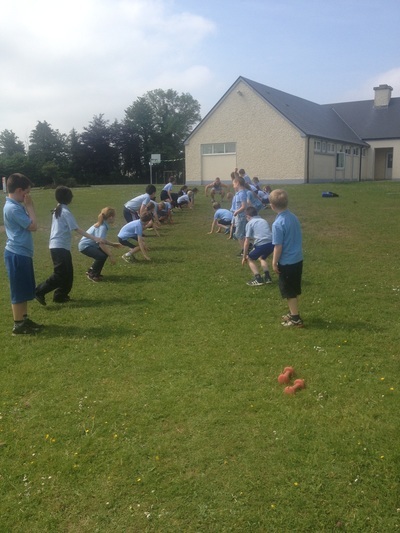 On Thursday,Darren also worked with the children on their Gaelic Football. 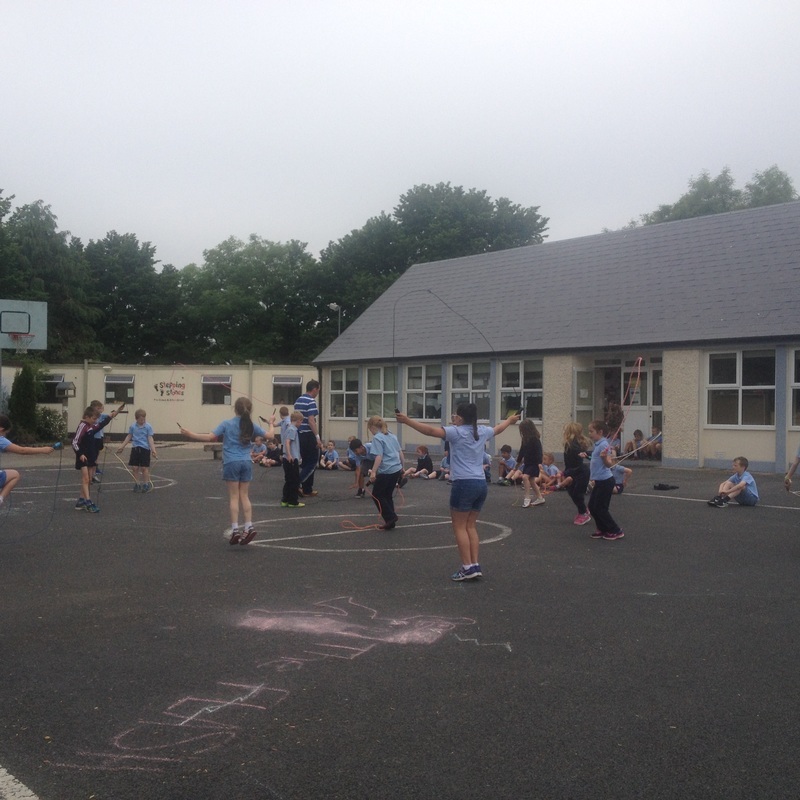 On Friday, we had gymnastics and orienteering. 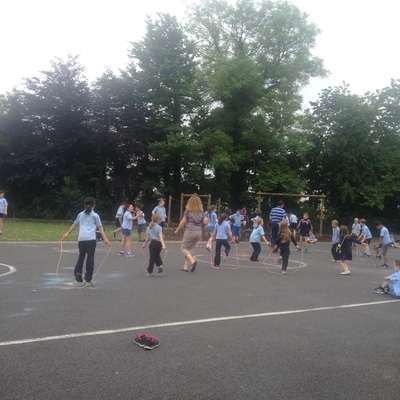 Instead of academic homework, the children got physical tasks every evening as their homework. 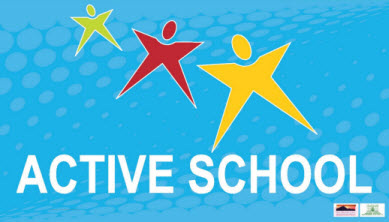 We all designed active school certificates and the winning design was Joe Clancy. His design was given to everyone on an active school certificate! What an active week! 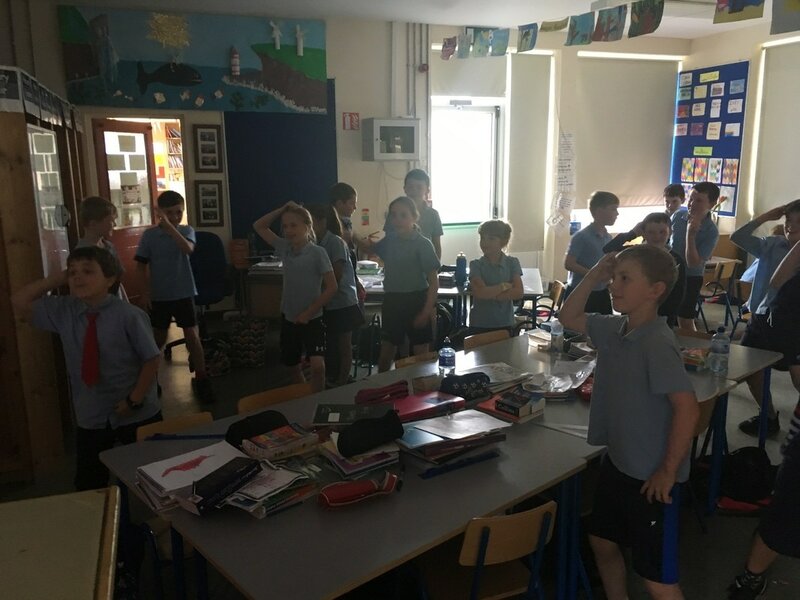 For information on the flag itself please click on the link below. 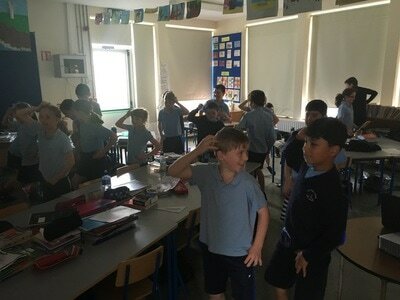 VID00006 from ann lynskey on Vimeo. 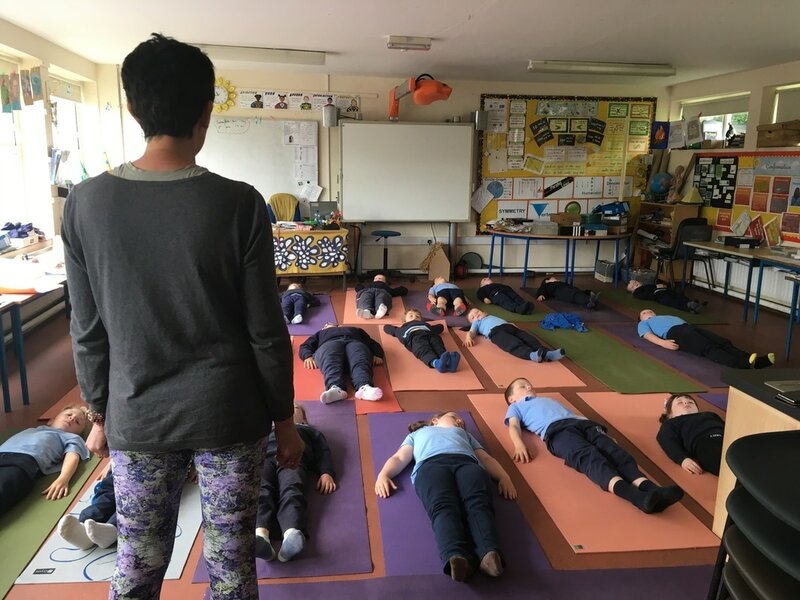 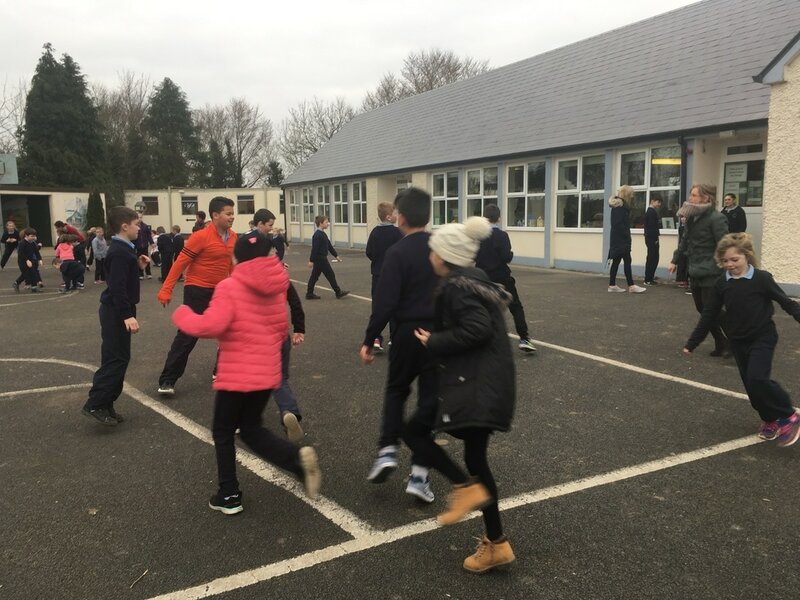 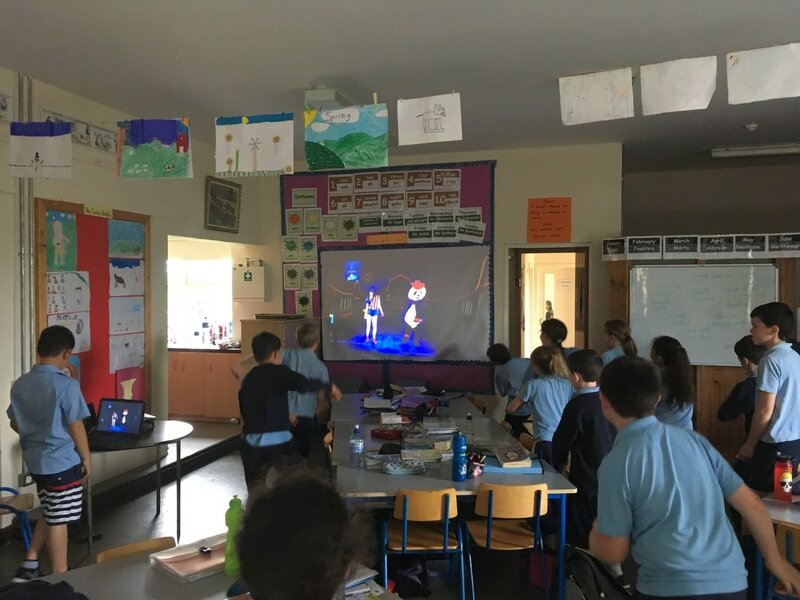 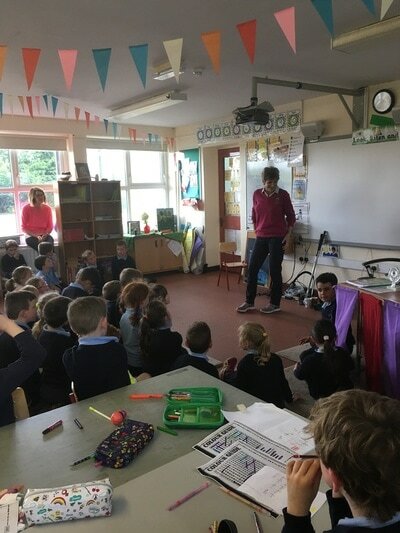 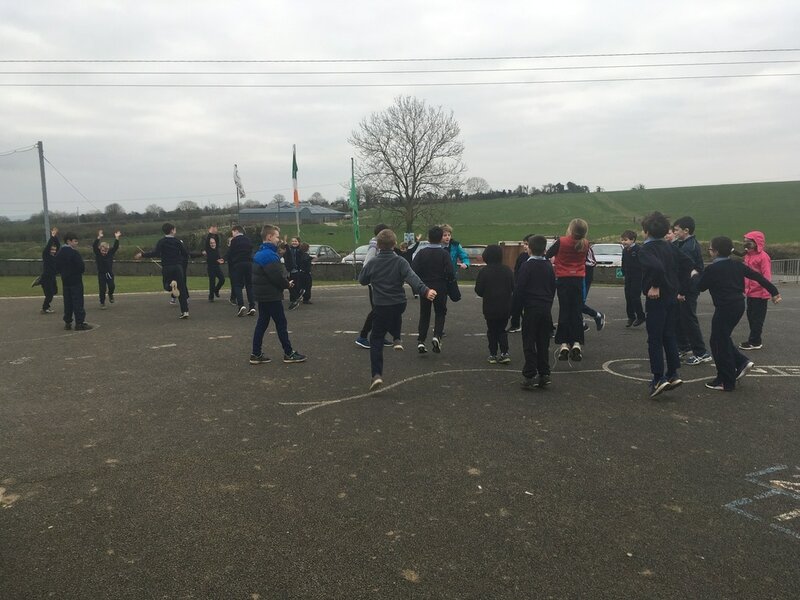 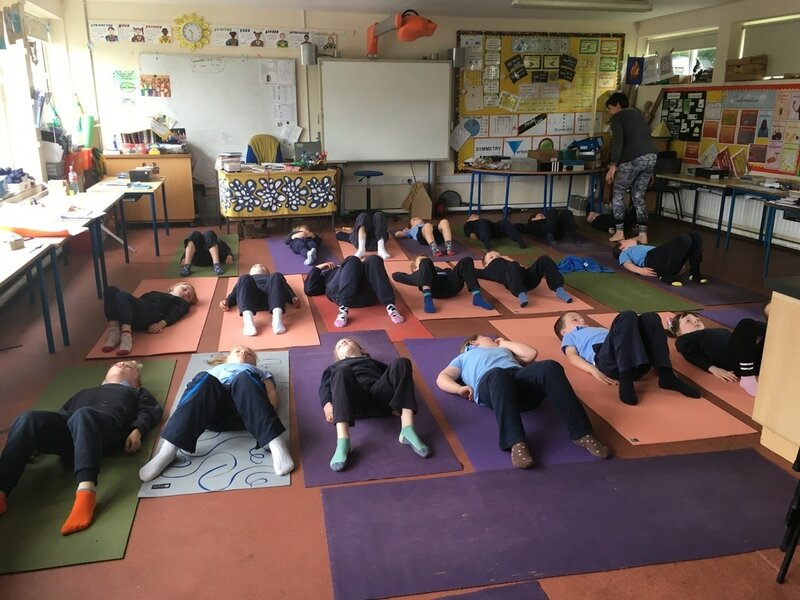 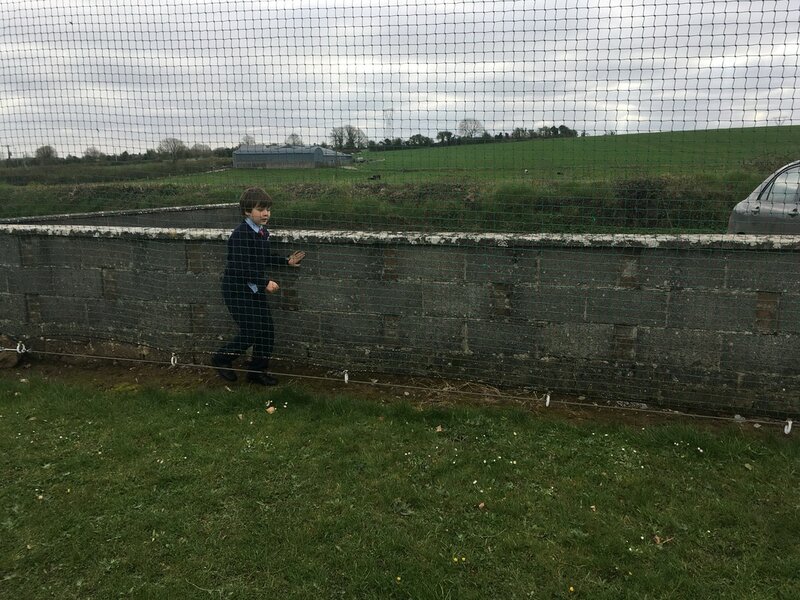 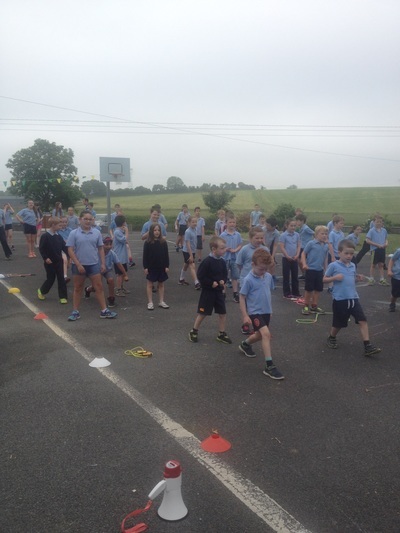 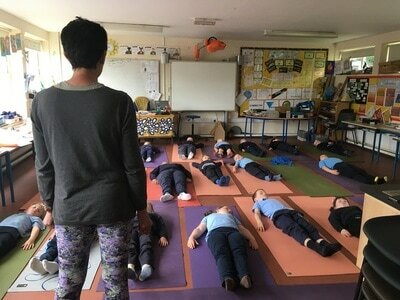 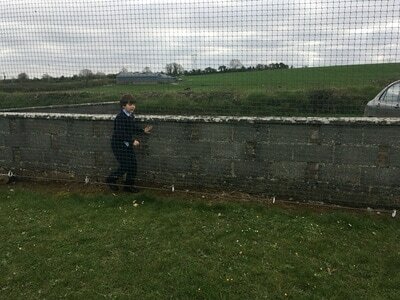 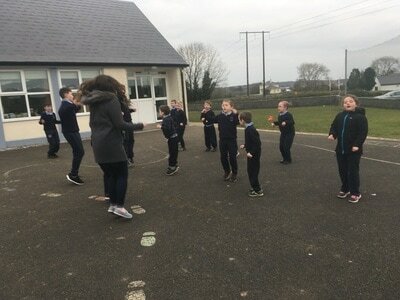 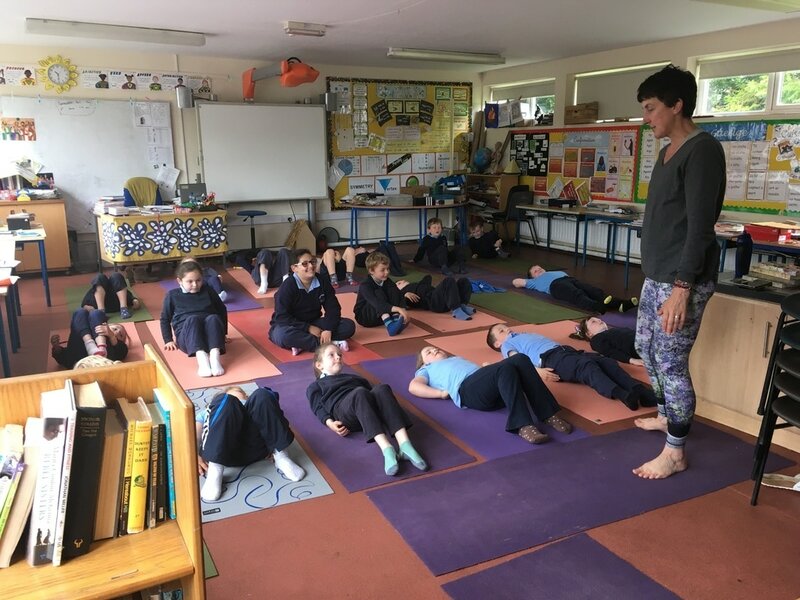 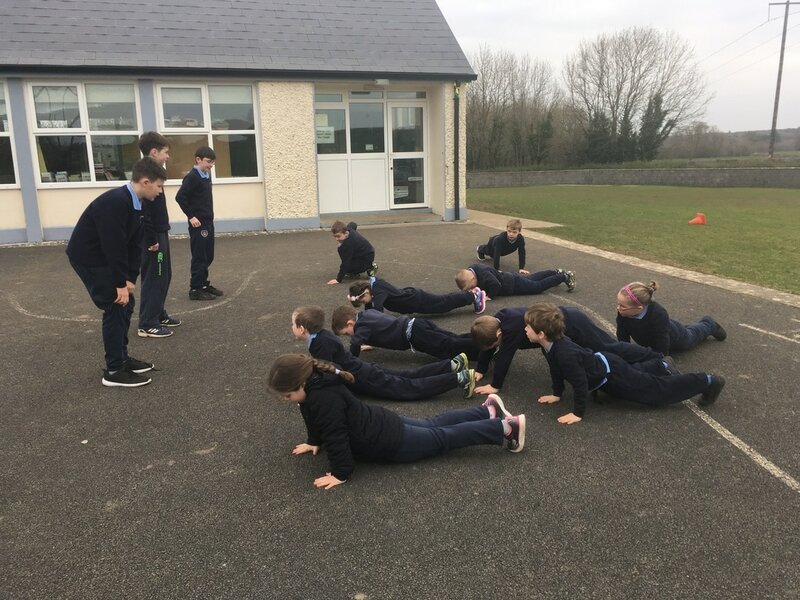 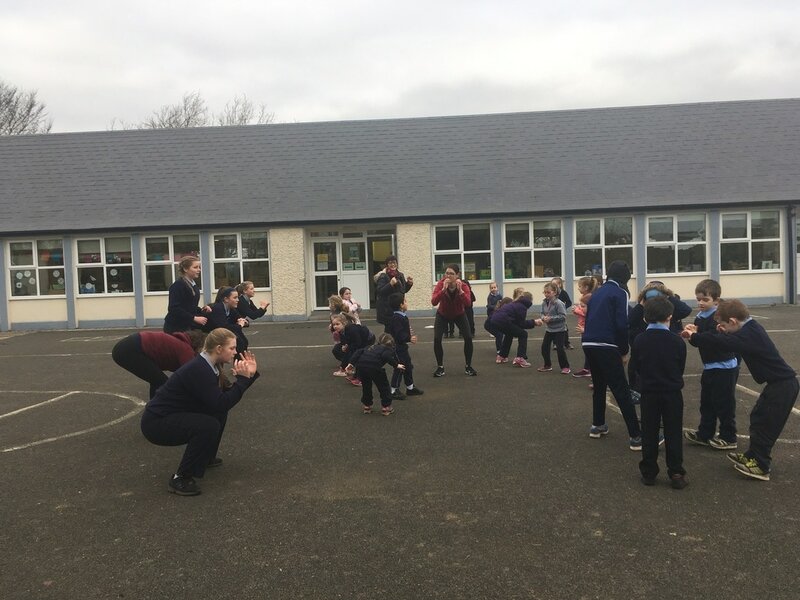 We were very lucky to have been nominated as one of two schools in county Galway to take part in the Boston Scientific and Irish Heart Foundation Step Challenge. Each pupil received a pedometer and a class walking challenge. Junior and Senior Infants walked to Germany and back, 1st, 2nd and 3rd walked to Italy and back and finally 4th,5th and 6th walked to Poland and back. 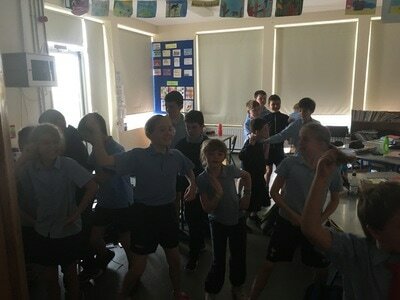 This was a great success with all classes achieving great results. To make this even better, we were awarded a voucher for €500 for Lifestyle Sports for our participation. We are very grateful to Boston Scientific for this opportunity and their generosity. 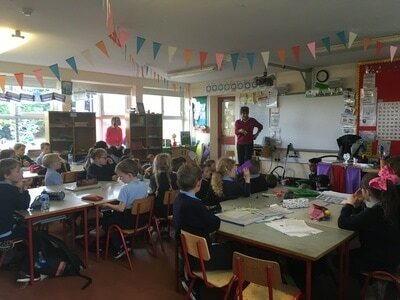 We also received a trophy for our efforts which is currently on display in the school hall. We are once again hosting a World Cup. 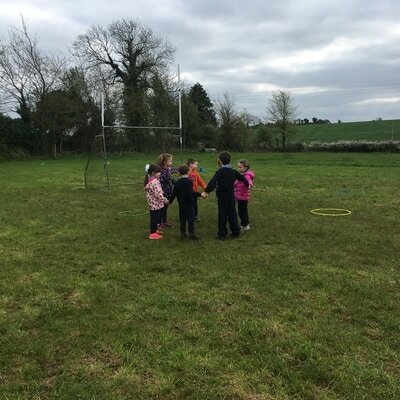 This year there are eight teams involved; Ireland, England, France,Italy, Argentina and Germany. 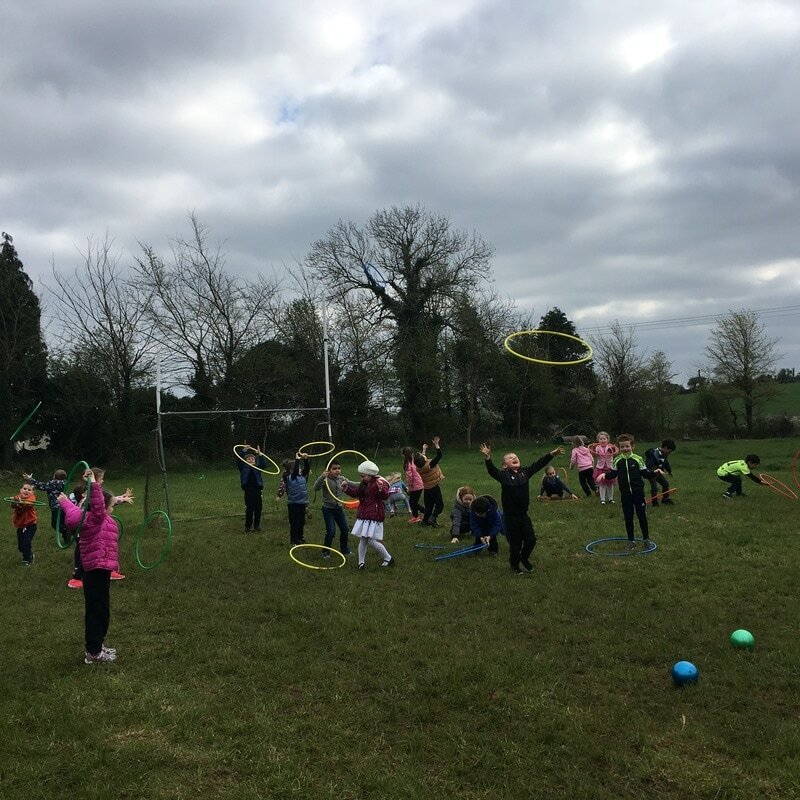 Our annual Fun Day was another great success this year. 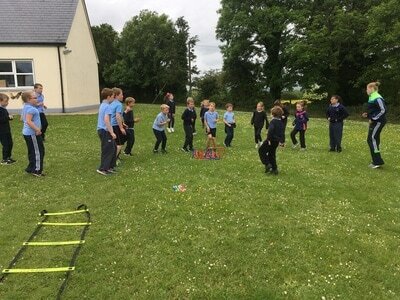 We had a bouncy castle, Parents v Children soccer matches, spud n' spoon race, three legged race, sprints and sack races. 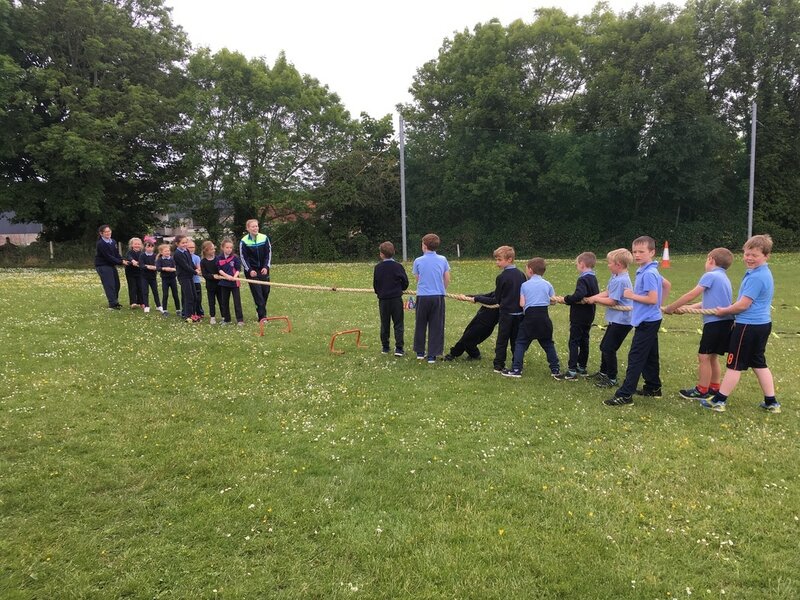 This was very well supported by all in the community and it was lovely to meet some of our incoming infants and preschoolers. 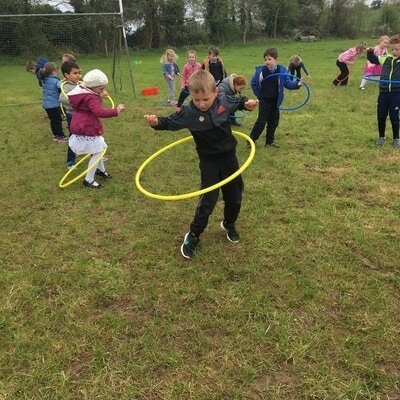 Please find pictures on Fun Day page.